Don't worry, I haven't gone all fashion bloggy like the reality TV show, What Not to Wear, on TLC. This post is not about trying to give the fashionably inept advice on what to wear. 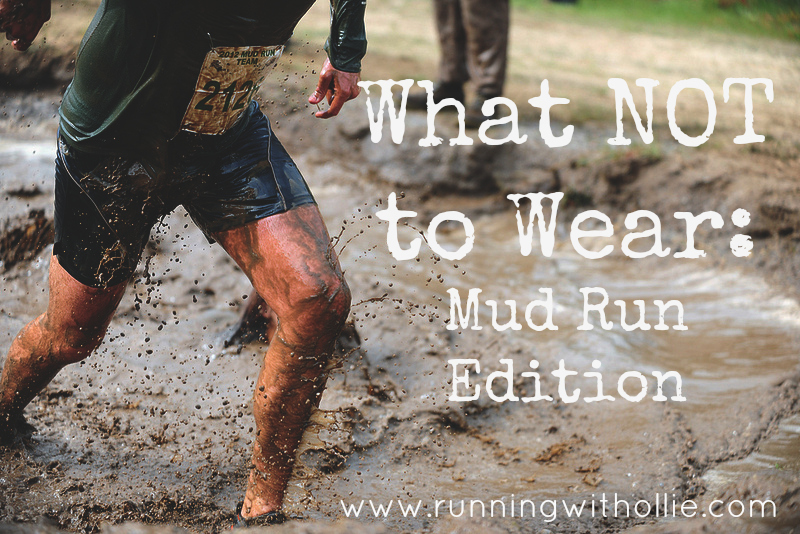 This is about giving mud run newbies advice on what NOT to wear on a mud run to avoid unnecessary hassles that can literally drag you down. Stay away from all clothes that are made of cotton or cotton blends. Cotton absorbs water (and mud.) You will get muddy and the weight of the water and mud will absorb into your clothes and weigh you down, or even worse, weigh your pants right down to your ankles. No one wants that. Leave the sweat pants and sweat shirts at home. Think lighter. Look for clothes with wicking properties (pulls moisture away from the body) and man-made fibers, like polyester and spandex. Are you catching on to a theme here? Cotton socks will absorb mud and water, make your feet heavier than they need to be, and cause nasty blisters. Look for light-weight ankle socks made of any material but cotton. Knee socks are cute, but proceed with caution. If they absorb too much water, they can get heavy and end up like wet heavy donuts around your ankles. If you wear knee socks, be sure they are tight fitting (like compression socks) and made of anything but (yes, you guessed it) cotton. Baggy clothes leave more material to get weighed down in the water and mud. Wear clothes that fit close to the body for the most comfort and least extra weight. I like to wear capri-length pants to protect my knees, as I will certainly be doing some crawling, where the first impact to the ground is my knees. Some might argue that sunglasses help keep the mud out of your eyes, and while that may be true, you also stand a great chance of loosing them in the mud pits. Expect to be completely submerged in water at least one time on your run. If you decide to wear sunglasses, be sure it is not a pair that would break your heart (or bank account) when/if they get lost in the mud pits. Zippers can get caked with mud and get ruined. Proceed with caution. If you wear a jacket with a zipper, be sure it is one you don't mind tossing at the end of the run. While it may be a no-brainer to leave the bangle bracelets and fancy necklaces (or tiara) at home, it also may be a good idea to leave your wedding ring or any other meaningful piece of jewelry safe and sound in your jewelry box (or jewelry pile, as in my case) at home. I can't imagine anything worse that losing a sentimental piece of jewelry in a mud pit. It is better not to risk it. I Have a Discount Code! YAY! I have a discount code! 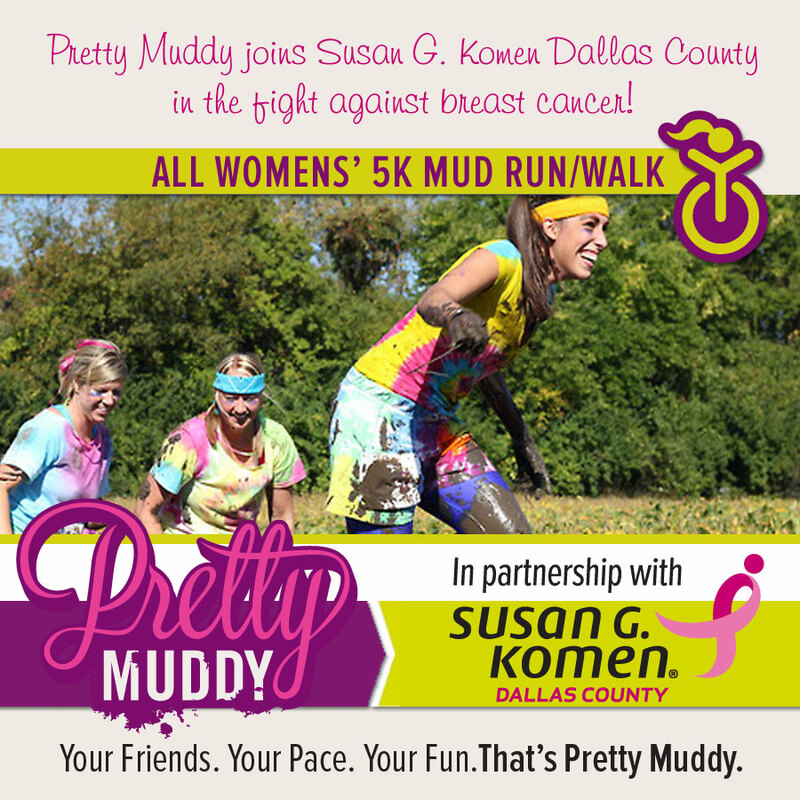 Pretty Muddy is partnering with Susan G. Komen of Dallas County. From the site: "To kick off the partnership we will be giving away 250 free registrations to cancer survivors as well as $10 off registration using the code "KOMEN", plus $5 of every registration using the code "KOMEN" will go back to Susan G. Komen of Dallas County"
If you want to join my Pretty Muddy team in Dallas Texas on June 1st, just sign up under the team name "Running for Dummies Blog" at the 9:30am wave, we'd love to see you there! Disclosure: I was provided a free registration to the Pretty Muddy run in exchange for blog posts about the event, but I am under no obligation to give them a positive review. All thoughts and opinions are my own, If I hated it, I'd tell you. Great tips, though I doubt I'll never need them. I never thought about it much beyond "wear your oldest and ugliest clothes that you never want to wear again." yes! that is a good tip too! yes, common sense. who has that? no one, that is who. ha! I've done one mud run and wore all black. I thought I'd never wear the clothes again after that day because they'd be trashed. Surprisingly they came clean! I ran Pretty Muddy last fall. It was fun! I also wore all black because who knew how/if the mud would ever come out? good idea to wear all black! I ran a mud run last summer. Definitely agree with the cotton/loose clothing tip. It's tough to move when you weighed down like that! Oh my, I am not sure what I would wear. Thanks for the tips! I'm running the 9:15 wave, it's my first mud run! Thinking about heading to walmart for some throw away shorts and shirt! perfect timing! I'm running my first Mud Run on Sunday! Thanks so much for the tips! Great tips! I haven't done a mud run yet, but it's on my list! And if I was back in Dallas, I'd definitely jump on board this mud run! Looking forward to photos! Good luck! Great tips! I was planning on wearing shorts, since I imagine it wil be hot in August, when I do my first mud run (Tough Mudder!! ), but after reading this, I'm thinking I need capris to cover my knees. Good point. That, and wear shoes I can give away and bring an extra pair to wear back. Excellent post my friend!